Genoa vs. Orrville from Mark Schreuder on Vimeo. On to this year. It's amazing that after just one meeting, the Riders and the Comets have established quite the rivalry. That rivalry gets chapter number two on Friday night....but this year, it will have much bigger stakes. Namely, a regional title and a berth in the state final four in Division IV. So let's talk about what each team brings to this game, and what each will need to do well to hoist that gold trophy and take the next step towards Massillon. I wouldn't have predicted the Comets to get this far, heck, I didn't think they'd beat Ottawa-Glandorf in the first round....and I certainly didn't think they'd beat Clear Fork. But they did, so give them plenty of credit. They've won a shootout and won a low-scoring game so they can do it any way that's necessary. They run the same offense that they did last year....a wing-t that utilizes lots of misdirection and several options on each and every play. The key to any wing-t is proper execution and Genoa executes better than most teams. The Comet run game is led by sophomore Kyle Nutter, who leads the team with 1100+ rushing yards. He's averaging over 175 rushing yards in the Comets two playoff games. Brandon Roberts, Seth Dufendock, Chris Cuevas and even QB Josh Bryer are capable runners for the Comets, so they have plenty of options out of the backfield. If they need to throw the ball (which they do about 8 times a game on average), Bryer's favorite targets are Derek Allgier (25 receptions) and Dufendock. On defense, the Comets like to be aggressive and get pressure in the backfield. Seth Dufendock is the Comets field general on defense. Other impact players on defense are Suburban Lakes League player of the year Andrew Hayes and defensive back Garret Scott. Hayes was the first lineman ever to be name SLL player of the year. The Comets also boast an excellent kicker in junior Tyler Pickard. He was an all-ohioan last year and kicked a school-record 47 yard field goal this season. How far away does that Clear Fork loss in Week 9 seem? Since dropping the 33-0 decision to the Colts (and casting serious doubts on the season), the Riders have reeled off three straight wins and are playing their best football of the season, at exactly the right time. Over those three games, Orrville is averaging 30 points per game and are giving up only 18. They aren't giving up the big play, are creating turnovers and even scoring some points on defense (Mason's INT pick-6 vs. Wooster and Max's safety against Elyria Catholic). They've also had leads in the past three games. After a nasty habit of falling behind early in games and having to play catchup earlier this season, the Riders have led all but about 15 minutes of action over the last three games (144 minutes of play)...and led from start to finish in both the Wooster & Elyria Catholic games. They've also done it by running the ball and not turning the ball over. Tre Simpson leads the way with nearly 1200 rushing yards on the season. That number puts him in the unofficial top 10 in Orrville history for rushing yards in a season. Another 100 yards or so will put him in the top 5 all-time among single-season rushing yards. Junior fullback Mason Monheim has also very very effective out of the backfield, as both a runner and a lead blocker for Simpson. Sophomore Kyle Lichti has dramatically improved over the course of his sophomore season. Through his first 4 starts, he threw 8 interceptions, but over his last 7 starts, he's only thrown 5 INT's. His decision making has grown by leaps and bounds and he seems more in-command each and every week. He'll look for Stewart Turner and Drew Brenner, but also has spread the ball around to Cody Rice, Max Pirman, Dylan Lemmon and both Mason & Tre out of the backfield. On defense, the Riders have made a name for themselves against spread offenses, making Triway QB Derek Carmichael and Elyria Catholic QB Danny Reaser throw the ball 97 times for their 500 combined yards. Their run defense will get a test this week. Junior linebackers Matt Davis and Mason Monheim are the primary playmakers, but linemen Trevor White, Sam Reusser & Derek Graber have been very effective all season. Max Pirman and Cody Rice have the ability to get to the QB, stop the run and also drop back in pass coverage. The Riders DB's, led by Tre Simpson & Stewart Turner have shown the ability to shutdown any opponent's receiver. 1. Who steps up? Both teams know what the other will try to do on offense and defense. It might be about what player(s) will step up and make some unexpected plays. 2. Big Plays vs Long Drives. Genoa would rather grind out long scoring drives while Orrville has made plenty of big plays all season. Maybe this game hinges on Genoa's big play ability and Orrville's ability to have long drives, like their 18-play, 89-yard drive against Elyria Catholic. 3. 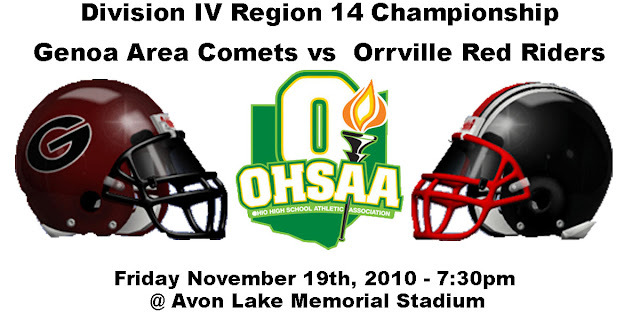 Orrville's D. It's important for the Rider defense to get stops and stay away from time-consuming drives by the Comets. That's shortens the game gives a clear advantage to Genoa. They cannot be on the field all game and get worn down like they did against Clear Fork. Make Genoa play from behind and momentum swings heavily in the favor of the Riders. 4. Who wants it more? Genoa wants revenge for 2009, even if they won't admit it. Orrville wants their first regional title since 1999. Pretty much a clean sweep for the Comets. Just like before the 2009 matchup. We all know how that worked out...so I'm fine with Genoa being picked. I think Orrville has the talent, schedule strength and post-season experience to win this game, but it will all be about how they (and Genoa) execute. The teams that executes better and doesn't turn the ball over will win the game. Every team left standing this time of year is a quality team. Yes, Genoa came into last year's game extremely confident, but they hadn't been tested all season. We tested them, in every way a team can be tested. This year, Genoa has been tested, a few times in the regular season, but especially in the last two weeks. They've played (and won) the close ones, so they wont be rattled this time around. It has the makings of another classic. Let's get this thing on. Riders, it's right in front of you. Let's play 48 minutes and take one more step toward week 15.